The reviews landscape is ever-changing. This article is written to bring everyone up-to-date with our strategy for those in hospitality. One of the major problems we encounter when meeting clients in hospitality is a sense of over-familiarity with reviews. TripAdvisor and Booking.com (and the rest...) have been a part of your lives for so long now it is difficult to remember a time before online reviews. Here we will show you why you should examine your review management strategy afresh. If you have encountered HelpHound before, you will notice that our own strategy on behalf of our clients has evolved, so bear with us! Actual out-turn for a client. And these results are remarkably uniform across locations and types of property, with positive reviews up around 25% and negatives falling - from outset - by three-quarters! ...it's as simple as that - from day one. And you can imagine the impact that will have on your ranking. Most restaurateurs understand just how important looking great in search is by now. But few have yet to adopt professional review management. By automating review management you know you will look great in search, with a constant volume of reviews keeping you right at the top for your location and speciality. Most of you will be familiar with the Times' recent negative publicity for one major national chain - all based on their Google review scores. Proactively inviting comments through Dialogue will dramatically reposition any restaurant will a similar problem - from day one - providing really useful feedback for management at the same time - and no paper forms needed! 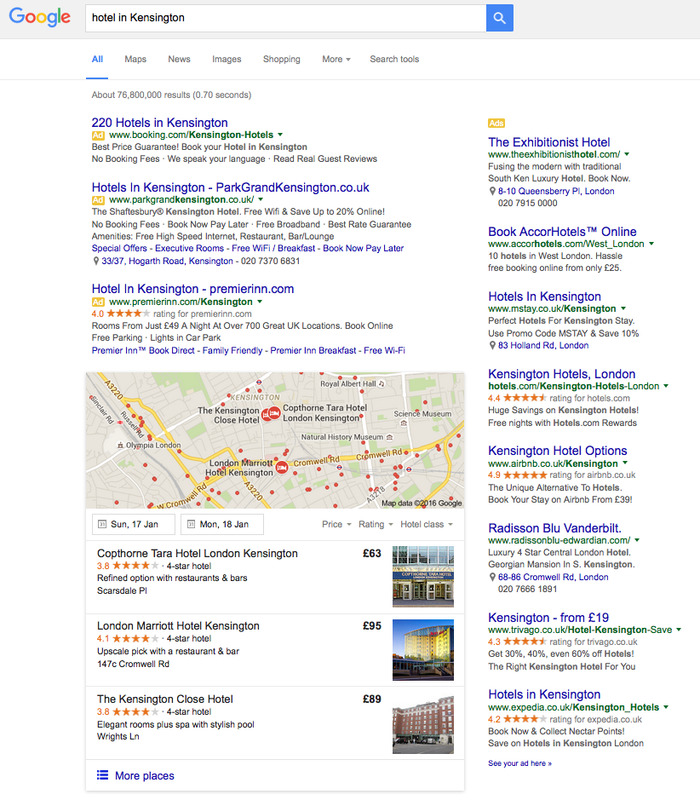 Google reviews have been slow burners, but they increasingly dominate in search; if your focus has been on specialist hospitality sites, perhaps you should be considering the impact (both positive and negative) that Google reviews will have going forwards. This is a desktop (as opposed to mobile) search - see further down for mobile (more than 60% of search now). 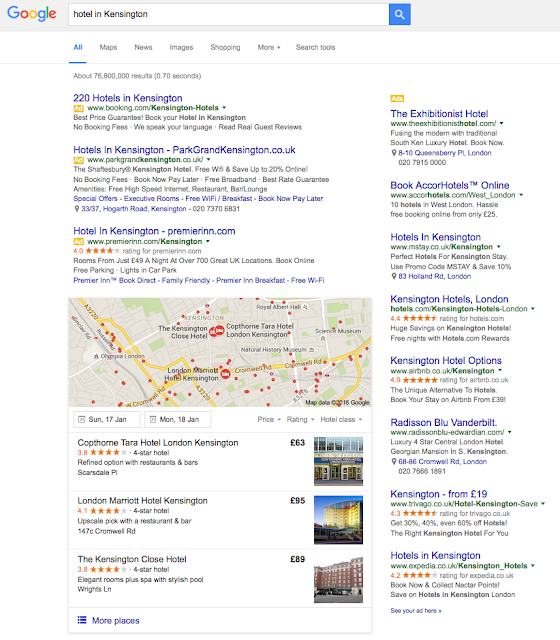 This screenshot shows just how dominant Google reviews have become in search - the only natural listings above the fold are contained in the Google 3-pack. 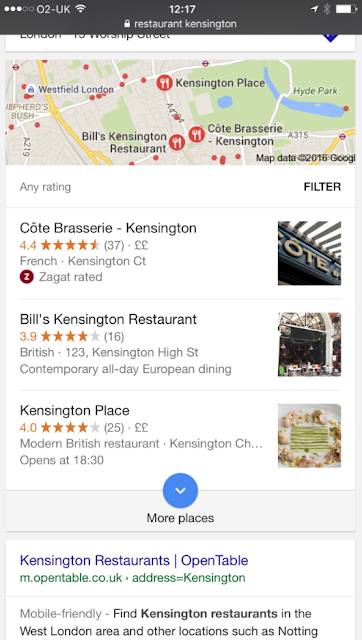 We predict that Google will refine this to list the 'Top 3' in any given local search. 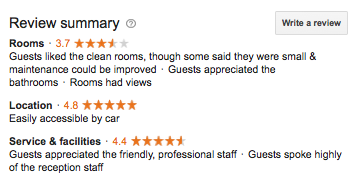 At 4.4 this hotel's headline score is OK (just 'OK' - to be 'Great' it needs to be at 4.5 or over) but the score (and review summary) for their rooms must be hurting (both their headline score and bookings). How much of a difference would it make if you appeared in the Google 3-pack? And by-the-way, for those wondering what the 'FILTER' button does - it enables the user to filter out any restaurant that score less than 4.0! We are so confident that Dialogue will produce great results for you that we don't ask new clients to sign a contract for six months; so just contact Karen Hutchings to start trialing Dialogue for your hotel, restaurant or spa right away.